Parker Arizona…….We came, we saw, we got defeated…….again!! Thursday morning, Stewart showed up with the truck, ready to qualify for the 2012 BITD Blue Water Desert Challenge. We showed up at the Blue Water Casino to register for the race as well as qualifying. We were set to start fourth in qualifying. We arrived back at the truck and began prepping it for qualifying. We added a splash of fuel, just enough for the 3 mile qualifying lap, removing the rear tires to lighten the truck enough to hopefully gain some ground. The rain was relentless. Mother Nature decided to open up and water down the track, adding for a little dust control. It didn’t help. Our first lap around was good. It was definitely a lot better than our second lap. Due to the heavy rains, the generator that Casey Folks was using to operate the red and green lights at the start line, malfunctioned and we probably lost a few seconds at the start line. Due to unknown reasons Casey combined the 7200 class and the 1000 class vehicles together. All in all, we settled for a 13th place qualifying spot, starting next the 12th place starter, Randy Merritt, #7281 of KC HiLites/Mongo Racing. Saturday morning, October 13th, we enjoyed watching the 1st race and then began setting the truck up for the race. Completing our normal, pre-race check list, the truck was ready. Stewart Dixon got into the driver’s seat and Derek Dixon was navigating. They warmed the truck up and staged for the 3rd race. Staging was at 9:45am and race time was 10:15am. We lined up and hung out with the Lost Boys crew, waiting for the time to start our engines and take to the start line. 10:15a.m. rolls around and we start the race next to Randy Merritt. We got the green light and the race has begun! The start of the race was more set up for buggies and not a 6,000 pound truck with a 540 horse power engine. We were bogging down and bogging down bad. We lost off the start line to Mongo Racing but this was about combined times. We still had Sundays to race to better our final position. The truck was holding up. The race course was a 3 lap race. The first and second laps were 26 mile loops with the last lap being 21 miles for a total of 73 miles. We were keeping a average pace at an average of 33 minutes a lap. Stewart and Derek passed Gary Dixon, Jeff McCullough and Kevyn Thaxton in the hot pit, while they were yelling into the PCI radio, it was difficult to understand what Stewart was saying. We attempted to reach them but they were gone. We were going to finish the first race! Looks like Parker isn’t going to get us this time.. WRONG! We went to the Ford Mesa, to watch the 7200 class trucks and 1000 vehicles come to the finish line. At 1 hour and 39 minutes, Lost Boys #7205 unlimited Ford crossed the finish line. Unfortunately, Parker beat us again at their own race….AGAIN!! Four turns from the finish line, Stewart heard a pop in the engine and lost all horsepower. They pulled it into the Ford Mesa, smoke billowing from the engine breather. We were done! We burned up our piston rings. 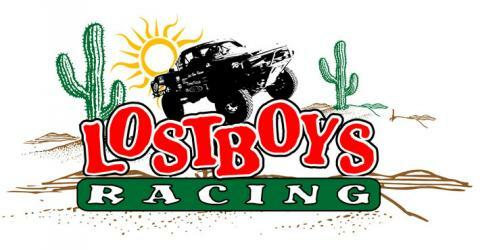 Will there ever be a moment where Lost Boys Racing will beat Parker Arizona at its own race? Stay tuned for the Parker 425 in February. We hung out at camp and enjoyed everyone’s company. We barbequed! We ate! We had a good time with friends and family. The kids had a great time swimming in the river, and we relaxed. Lost Boys Racing may have lost the 2012 BITD Blue Water Desert Challenge, but having our friends and family out there, cheering us on, WE WON! Next on our agenda, 2012 BITD Henderson 250, November 30th-December 2nd. Stay Tuned for Blue Water Challenge photos coming soon.